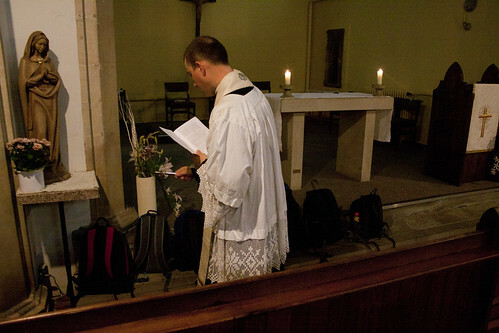 Fr Redman blessing our pilgrims' scrips - aka daysacs. The liturgy along the way was excellent. Though I say it myself - as one of the two singers - the singing was highly competent, not just 'well we got through it somehow', and we had a decent number of servers; for two of the Masses we were joined by an excellent local MC. Although our Masses in Downham Market and Oxburgh were not widely advertised, we were joined there and at Walsingham by a good number of locals, including (at Oxburgh) the local LMS Rep, Lech Hansel (who not long ago redecorated the LMS Office for us). After the blessing in the Catholic Church of St Ethelreda, where we were sprinkled with holy water stretched out full length on the floor, we walked round the corner to Ely Cathedral. We had considered using this for the blessing, but in the end decided against it. Although the medieval craftsmanship in the Cathedral is breathtaking, the place has the atmosphere of a museum, and (presumably in an attempt to bring it 'up to date') is disfigured by some hidious modern art. 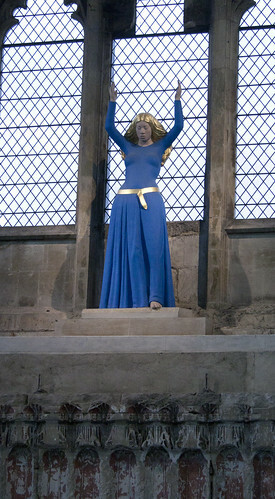 The statue in the Lady Chapel / Chapter House is quite notorious (it was compared by the News of the World to Charlie Dimmock; one of our group suggested it was a shrieking witch). 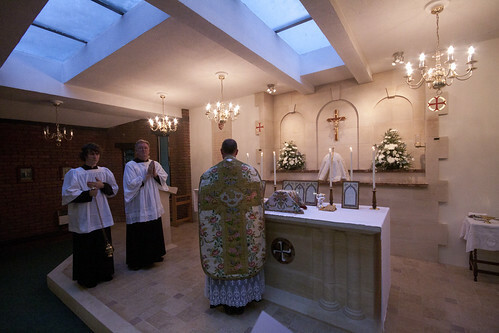 We contented ourselves with a prayer for the healing of schism and a look round. We had the Angelus at noon, and Mass in the Catholic church of St Dominic at Downham Market in the evening. 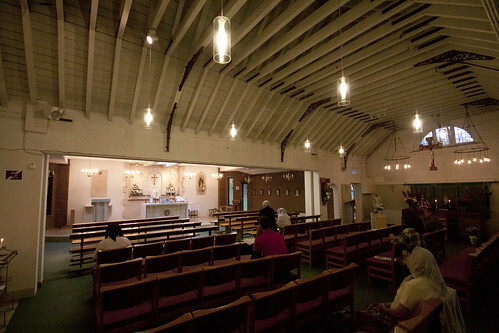 This is where the notorious Fr Oswald Baker refused to say the Novus Ordo from 1970 to 1975, when the Diocese took back control of the church; incredibly, he continued to live at the Presbytery, saying Mass elsewhere, until 1989, forcing his replacement to live down the road. 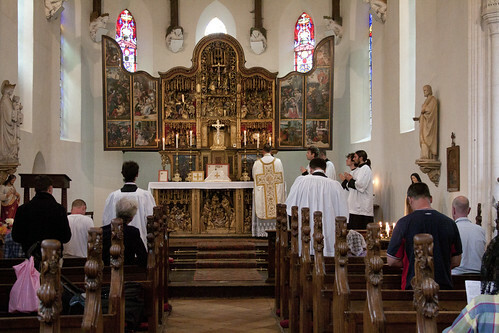 The church started life as a stable; since Fr Baker's time it has been extended, sideways. The altar was originally on the left wall, where you can just see some votive candles. The Mass was of St Bernard; the fine vestments belong to Fr Eggleston. The patronal statue of St Dominic, on the right, reminds us of the Dominican Sisters who initiated regular Catholic worship in Downham, in a chapel carved out of a large house next to this site. The following day we had a qute a contrast: Oxburgh Hall, and its private chapel, dedicated to the Immaculate Conception and St Margaret. Although built after the Catholic Relief Act (in 1836), the reredos is Medieval, and the chapel represents a continuation of the worship in more hidden places in the Hall itself during the times of persecution. Oxburgh is a very fine house, and boasts a priest hole. 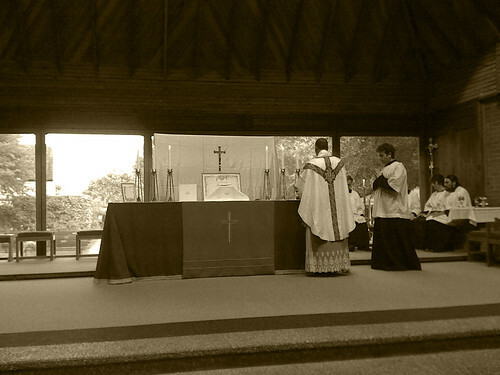 Since this photo wasn't taken by me, you can see our liturgical schola: even on the move, we were able to have a vested schola and a serving team of MC, thurifer, and two acolytes. 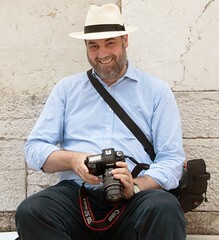 Standing up on the left, above, with a dark jacket and grey hair, is Henry Bedingfeld, descendant of the Sir Henry Bedingfeld who was the custodian of Princess Elizabeth during the reign of Mary Tudor. She is said to have remarked afterwards 'if we have anie prisoner whom we would have hardlie and strictly kept, we send him to you.' He refused to sign the Act of Uniformity, and the house became a centre for Catholic worship. Washing was hung out to dry on the hedges to signal that Mass was to be said. A later Sir Henry fought for the King in the Civil War and was imprisoned in the Tower of London for two years after his capture. A priest-hole can be seen in the house. These white vestments, for the Feast of St Jane Frances Chantal, the friend of St Francis de Salles, belong to the Bedingfeld family. 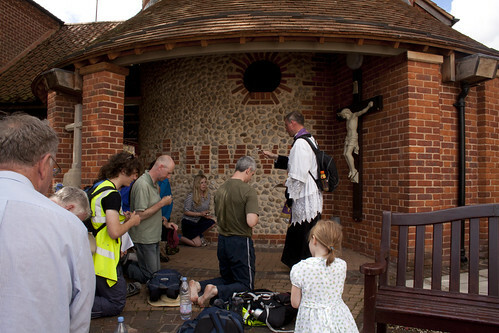 We walked first to Walsingham village, passing in sight of the Slipper Chapel on the converging road road. When we saw it, we knelt down and said a prayer of thanksgiving. Arriving in the village, we had lunch outside the recently built Catholic church, and had a final blessing before making the Holy Mile to the Shrine. The large church next to the Slipper Chapel (which is very small) is extraordinarily difficult to photograph. The lights seem to be far more yellow than usual artificial lighting, and the enormous windows means that the celebrant is back-lit. 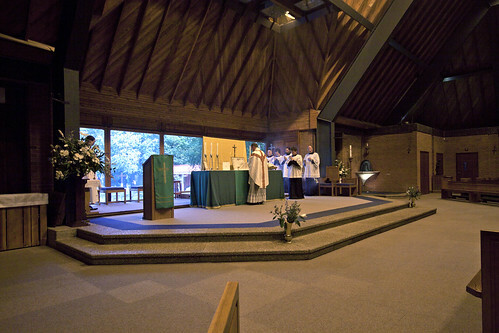 The windows can be opened to allow Mass to be said the other way round - with the congregation outside, on benches. As it is a recognised Shrine, we were able to have a Votive Mass of Our Lady; hence the white vestments (which nevertheless look yellow in photographs if you aren't careful). The vestments belonged to Paul Waddington, the LMS Treasurer who was part of our support team. 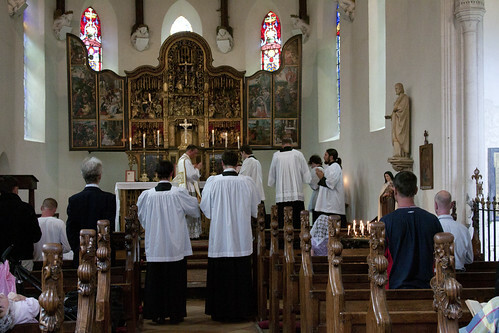 At Mass we were joined by Fr Thomas Crean OP; he can just be seen, on the left, in choir. The more you fiddle with the colour settings, the more flat the resulting picture; it looks quite decent in black and white. This was just last Sunday, not some bygone era! 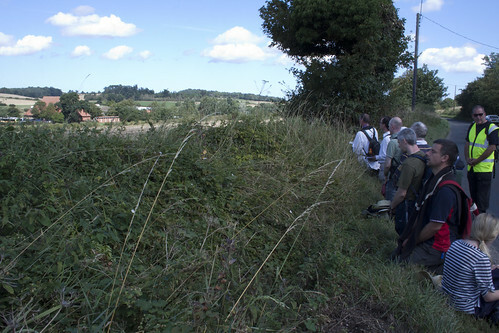 We were extremely fortunate in our chaplain, Fr Redman, who walked every foot of the way with us, Sang Mass each day, led the Rosary and the Angelus, gave us meditations on the way and heard confessions. He really was the ideal chaplain; I hope it won't take him too long to recover! See the full set of photographs, or a slideshow.